We are still at the park. I was hoping for a chance at a nap, but it is not to be. The human female is still talking plants with passersby and making an attempt to draw the pointed phlox that is everywhere. I like the “pointy” part of the name, but sadly, it is not really menacing enough. I am grudgingly impressed. By mixing blue and red, she achieved a sort of purple. It doesn’t match the plant, of course, but someone who knows the local flora would probably recognize what she was trying to convey. Oh ho! She has brought out a set of her own pencils. Let us see if she has any better luck with them. Still not exactly right, but Sigyn’s enthused! My love, remind me to buy you a fine set of pencils of your own. After a few sunny days, the local wildflowers have finally decided to muster up the effort to bloom. Today there is a Wildflower Day at the Boonville Cemetery and Heritage Park just north of here. Of course, Sigyn and the human female have gotten up early to go participate. I’m tagging along to make sure no harm befalls my beloved. The human female is on her own. There is a group of musicians on the porch, playing old-timey tunes on fiddles and dulcimers and other stringy, jangly instruments. Sigyn says it’s lovely. I say it’s not loud enough to drown out the human female’s prattling, so it’s no good. The organizers have given the human female a table of her own, and she’s put up a sign that says, “Ask a botanist a question.” People are stopping by to talk about native plants, things to grow in their gardens, names of wildflowers, and other matters of botanical nerdery. I’m having a good laugh, because the human female’s table is right behind the life-sized statue of some historic personage and she has more than once almost bid him good morning and asked him if he has questions. Across from the human female’s little bastion of all things planty, the organizers have set up a children’s area. It is well-stocked with coloring pages, crayons, watercolors, paper, and minuscule chairs. There is also a bubble-generating machine. I have directed the chilly breeze to blow the bubbles into the human female’s face from time to time. I can tell from Sigyn’s wistful expression that she really wants to join them. Dearest, you are so cute and portable that I’m afraid someone would swoop down and carry you off. The human female has brought some drawing paper and various implements of scribing—can you set up here at the table with her? See? The mortal has already begun to doodle a portrait of something she calls yellow star grass. Oh, you want to draw the tiny corn salad? I’m sure she’d give you some paper. You can probably share her colored pencils as well. How did the human female’s drawing come out? A little stiff, but she managed to get the yellow and green on the right parts of the plant, so I’ll give her that. By Volstagg’s mighty embonpoint! The organizers have organized some lunch. It’s for the good of her soul, after all. The Midgardians have been all caught up in the news of some sort of government report that has recently reached the attention of the media. Something about someone doing something to someone, blah, blah, blah, don’t bore me with mortal politics, blah. I can’t worry about all that. There’s been a government document causing a tizzy a little closer to home. Don’t read it! It’s lies, I tell you! All lies! You’ll recall that the human female made bacon rolls whilst her mother and sister (she of the similar high-pitched shrieky laughter) were visiting. The visiting family have been un-fetched, safely delivered to the airport in the Big City to the West. The humans are now left with an empty-seeming house, a blessed silence that seems to ring in my ears, and a quantity of leftovers. You wouldn’t think that there would be bacon rolls left over, seeing as how those amazing hand-held rounds of gustatory glory tend to vanish like good intentions, but there were actually two remainders. They, in their zip-locked Bag of Freshness were stored in the cold oven to keep marauding felines from feasting on such rarefied fare. The past four days have been one continuous eating frenzy of feasting both at home and in sundry eateries. The human male and female are opting tonight for simple fare The female is arranging some toppings on a rising-crust pizza. I have suggested that the male helpfully set the oven to pre-heat at 400° F.
…and the kitchen deities are jealous of their sacrifices. We have made it, finally, to the airport, in plenty of time to pick up the relatives, who are coming in on different flights, but both at the same terminal. This is the city where the rival to the humans’ university is, but at the moment, there’s a big Music/ Film/ Tech/ Entertainment festival going on, and A&M, hoping to gain some exposure, has paid an arm and a leg and plastered every plasterable inch with maroon and white advertising. The camera says, “purple,” but it’s really maroon. I can see six signs and a video screen from where I sit. Overkill, much? Sigyn, we have a little time to look around, since the sister’s plane is late. For starters, what’s going on with the floor? They can’t mean that the capitol square is in the airport? Not even Midgardians could be that daft. Ehehehehe! Sigyn is pretending to splash and swim in the Colorado. Take care, my love! We wouldn’t want you to drown! There’s a statue just over there. No one seems to know who he is. Oops. Sigyn says it’s a lady, Barbara Jordan, who was a lawyer, teacher and Civil Rights leader. That is all well and good, but when I take over the planet, I will be making the laws, and you can be sure I will be doling out the rights with a demitasse spoon. What is that booth-thingy over there? A flower-vending machine! What a clever device! 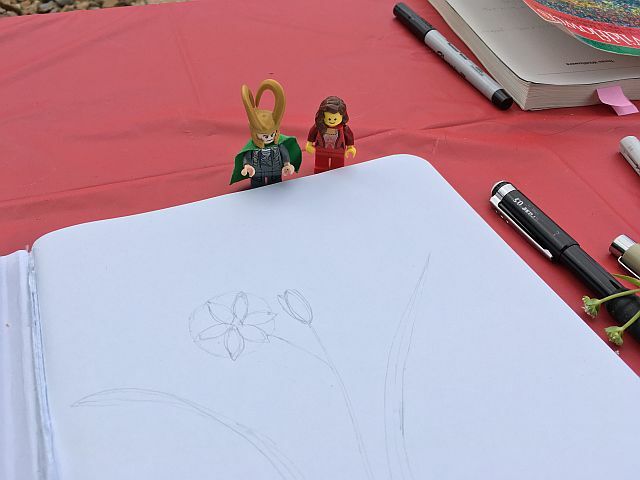 Sigyn, my love, would you like a bouquet? I didn’t bring a credit card, but I could go pick the human male’s pocket. Great Frigga’s hairpins! I hear squealing. The sister has arrived–can the mother be far behind? I fear I have just had the last quiet moment I will have for four days. May the norns have mercy upon my poor nerves!